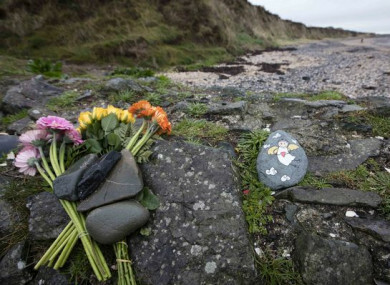 Flowers and a stone painted with the image of an angel near the location of where the baby's body was discovered. GARDAÍ AND REPRESENTATIVES from Tusla have appealed again for the mother of a baby girl whose body was found on a north Dublin beach to come forward for medical attention. Speaking to reporters today in Balbriggan, gardaí said that they had received a number of phone calls in relation to the discovery of the body of the baby on Bell Beach in Balbriggan. Gardaí have named the baby “Belle”, and are seeking her mother, who has not been identified or made any contact with authorities. They confirmed today that Belle was a full-term baby and was stillborn. Gardaí, along with health and social care professionals have stressed that the mother of Belle is not under any criminal investigation or in trouble, but that she needs to seek medical assistance. “She will know that the gardaí here in Balbriggan have named her beautiful baby Belle and we want her to seek medical attention and received the care support and attention she needs and she deserves,” said Tusla’s Eilidh McNab today. Sergeant Fiona Savidge told reporters that the gardaí’s primary concern was the welfare of Belle’s mother and the medical assistance she can be given. Belle’s body was found at 10am on Saturday morning on Bell’s Beach in Balbriggan, by a woman who was cleaning the area. It is believed the body was wrapped in some cloth and had been left on the beach not long after it had been born. Speaking earlier today on RTÉ’s Morning Ireland, detective inspector Brian Downey said that baby girl was a full-term child that had died at some stage before delivery. Gardaí have said that there was no foul play involved in the death. Downey said gardaí were concerned for her welfare and that she should contact either them or a hospital to seek medical treatment. “Please come forward… You do need medical intervention. You need medical help. Our only concern is the health and wellbeing of the mother. We don’t need to speak to her.. But we do need to know she’s okay. That she is safe… She is receiving the medical intervention she requires. Downey said that anyone with any information should contact the gardaí or Tusla or another state body to ensure the woman is properly cared for. Downey said that it wasn’t certain how long Belle’s body had lain on the beach before it was discovered, but that it wasn’t a lengthy time. “You’re talking maybe a day or so,” he said. He said the gardaí were concerned with creating “a safe environment” so that the mother would come forward. Also speaking to Morning Ireland, Dr Rhona Mahony – Master of the National Maternity Hospital – said that if the woman comes forward, she will be spoken to “in absolute confidence”. “We will speak to her in absolute confidence… our primary is care for her,” she said. A number of phone calls have been received by gardaí in relation to the discovery, and will be followed up. It is believed that a DNA sample will also be taken from Belle’s body. Gardaí said that the mother can call them in confidence on 1800 666 111. The National Maternity Hospital can be contacted on 01 6373100. The Tusla 24 hour service can be reached at 0818 776315. Email “Gardaí have received a number of phone calls in relation to discovery of baby 'Belle' on north Dublin beach”. Feedback on “Gardaí have received a number of phone calls in relation to discovery of baby 'Belle' on north Dublin beach”.